In 1992, she founded the Center For New Medicine in Irvine, California, where she serves as Medical Director. In 2009 she opened Cancer Center For Healing and in 2015 she opened Addiction Center For Healing. 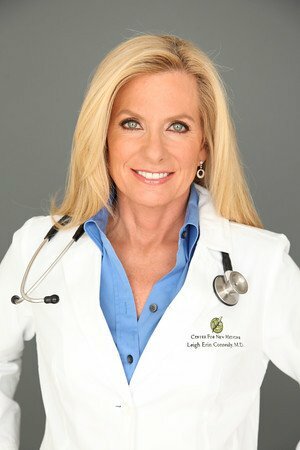 Dr. Connealy soon realized that conventional medicine had very limited returns and did not always improve the health of her patients. This led her to study integrative and complementary therapies, and since then she has revolutionized the landscape of medicine through her integrative medical centers: Center For New Medicine, Cancer Center For Healing, and Addiction Center For Healing. Dr. Liza Leal knows something about pain. She lives with rheumatoid arthritis, a chronic, painful inflammation of the joints. Leal began experiencing searing, persistent leg pain during her junior year of medical school. She completed medical school and began her residency in a wheelchair. Today, as a family physician and one of the few physicians Certified in Pain Management, Leal is out of the wheel chair thanks to a comprehensive approach to pain management. "Of the thousands of patients, we see each year, I hear great unsolicited feedback. You see people's lives improve because they are doing a natural thing, drinking water… so drink better water! Every drop is significantly reducing inflammation. Choosing to be well is serendipitously simple! It is such a powerful and energizing choice, that's why I choose EarthWater products for me and my family of patients." Dr. Chirase brings an incredible wealth of knowledge concerning the attributes and health benefits of humic & fulvic acid. Dr. Chirase has given many lectures to universities and to the medical field on fulvic/humic acids. His FULHUM creation which is our proprietary fulvic humic blend available only to EarthWater, as well as his access to a million-year-old humic mine that supplies the only USDA organic minerals, ensures a superior product. His company is a full service manufacturer and laboratory for fulvic based products both for human and agricultural uses. For more than twenty years he has been a proponent of fulvic/humic acid, educating people about the attributes of the product. Dr. Michael McNamara is a Medical Doctor practicing a unique specialty of preventive health checkups using the most sophisticated modalities of diagnostic imaging and blood analysis. Dr. McNamara was a pioneer in the specialty of Magnetic Resonance Imaging (MRI), having founded the FIRST hospital-based MRI department in Europe, in 1986. His professional healthcare and business interests cover a range of specialist areas; from groundbreaking diagnostic medical MRI and CT imaging, to medical imaging contrast media pharmaceutical development and clinical testing, to preventive medical health clinics, to IT solutions for mining of raw medical data for improvement of healthcare management, to the development and distribution of unique disease- preventing health supplements and nutrients.